I recently did the quick hike to Banyumala Twin Waterfall in north Bali. This is a short, downhill (not scary) hike that takes about 10-15 minutes, leading to a nice group of small waterfalls joined together. It’s called a twin waterfall, but it’s actually more like a hundred tiny waterfalls all converging into a pool. In my opinion this is actually one of the nicer waterfalls in Bali. It would be great for a swim too, although the water was a bit cold. When I went to Banyumala in the evening, I was also the only person there! It was a sharp contrast to some of the more crowded waterfalls like Tukad Cepung. At the bottom of the trail, there is pagoda to sit under and also a bathroom / changing room if you plan to swim. 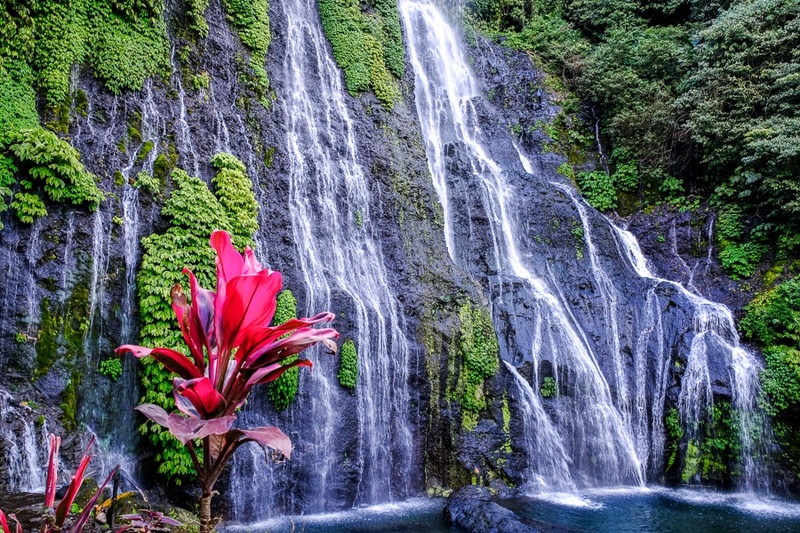 Banyumala Waterfall is in North Bali, about 2 hours drive from Ubud or 1 hour from Singaraja. Make sure you stop at the second parking area, not the first; it’s significantly closer to the waterfall so it’ll save you from hiking as far. The walk to the falls from the last parking area is only about 10 minutes. As of 2019, the entrance fee is only 15,000 IDR ($1 USD).